Now, the May graduates are finishing up the last classes of their undergrad years. They’ve bought their tassels, turned in their name (as you pronounce it, not write it). They’re looking for jobs, ready to head out into the real world (or not). What about those of us who are left? Who’ve got just a little bit left to go? I think we should take advantage of that last semester. Fit in one last internship, either this summer or in the fall. Find something you love, maybe it will lead you into your first post-grad job. You’ll be there soon enough. Round out your undergrad education with something that helps you figure out what you want to do. If you’ve done your internships, or just don’t have time for the commitment (there’s a reason we’re still here, right? ), then find somewhere to volunteer. It can be something related to what you want to do, or you can do something completely different. Go ahead and pet animals at Animal Allies. Plant a garden with community projects. Volunteer at a day camp. You’re not just your career, do something just for you. That doesn’t mean you can’t put it on your resume though. You totally can. Not every major has some big capstone project. If you haven’t done something that really shows what you can put into your work, do it. Find out what it takes to do an independent study or an honors project. Independent study you usually find an advisor, pick a topic and develop some research on it. It may be combing the archives or making surveys to find answers. Honors projects can be along the same line, but take a little more time to develop and often involve more hands on work. If you don’t have a full schedule, take something fun. Be the (super) senior in a first-year class. It’s a good time to reflect on everything that’s happened the past four years. Take something that you’ve been interested in, but didn’t fit any requirements. Take a dance class, or an art class. It doesn’t even have to be at your university. You can find all sorts of fun things to do in the community (bonus: it’ll still be there when you graduate). A lot of us have been doing school for 16 years straight. That’s ridiculous, when you think about it. So give yourself a break. I mentioned dance class, right? Find something that lets you breathe, if you haven’t already. Pick up a book! One that isn’t connected to school. Once you’re out “in the real world” you have to be a person again, not just a student. Take this time to get reacquainted with yourself. I think this goes for the May grads, too. Bottom line, we’re almost through! Make the last few months of your undergrad years count; however you want that to be. Interviewing is tough. You want to make the best impression on the people who could be your employers: be friendly, outgoing, confident, and ready for the job. Sounds like an Extravert’s game. Not necessarily! 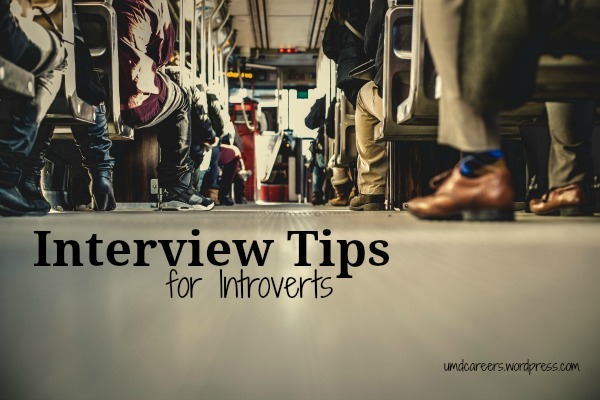 Play to your strengths as an Introvert and you can have the best interview ever. A big part of interviewing is learning what they want to hear. You can usually catch this by how they ask questions, what questions they ask, and in what order. Make it known that you’re listening and considering what they have to say. Then you can answer the questions knowing that what you’re saying matches up to what they are looking for as best it can. In an interview, people get nervous. They speak quickly because silence is scary. Silence is your friend. If you begin talking before you know what you’re going to say, you may trip over your words and say something different than what you intended. So don’t process out loud. Listen (actively) to the question, and then take a minute to formulate what you have to say. Once you’ve figured it out, you can say it clearly and confidently. For anybody, the best way to ace an interview is to know your stuff. Know your strengths and weaknesses, know about the company and what you can bring to the table. Coming in prepared will help you shake off any jitters. It also lets you frame what you’re going to say in your head. Some introverts have problems “bragging,” which can be a problem with interviewing. So don’t think about it that way. Use your quantitative achievements, and state those as facts. For example: “I raised $500 by creating and managing an auction at the annual fundraiser, which was a $200 increase.” You can refer to items on your resume, but go beyond that. Small talk – Yes, it is necessary. Make it natural. In Minnesota, we really do like to talk about the weather. Talk about something simple that you can chat about. Show your Passion – As an introvert, it can sometimes be hard to show other people my passion. Here’s the trick: The interviewers probably have similar interests. They’re here too, right? So treat them like an insider into your world, and share your passion with them. Just don’t get to caught up in it. Be Confident – Something everybody worries about going into an interview: Are you good enough? But an interview isn’t about if you fit this specific benchmark, it’s about how well you’ll fit into the company and the position. It’s as much an audition for them as it is for you. Ask Questions – Make sure to ask meaningful questions. Ask about the position and its development, your predecessor(s), and the office culture. Ask about the future. You want to make sure this is going to be a good fit for you. So prepare for your big interview. Do research on the company, and on yourself. Figure out what works. And be yourself. Stop in with any questions you have about your job/internship hunt or interviewing. You can check out Interview Stream any time and look at and record yourself answering popular interview questions. As an Anthropology major, there are plenty of places to go with my major. I could go into the field, or work in marketing, or social services, or anything that peaks my interest. Anthropology really teaches an out-of-the-box way of thinking, which is appreciated everywhere. Since we’ve learned so much in our major, we need to be able to quantify it on our resume. Don’t sell yourself short! If you’re working in the field, you might want to talk to a career counselor or your advisor to write a CV that will fit your needs. You can have a section for projects, where any completed research (qualitative or quantitative) can be showcased. If you have a research paper you’re proud of, list it. If you have any publications, those can be listed with other projects, or a separate section. Having experience in another language is useful for most fields, but it’s definitely a selling point for Anthropology. If you know another language at conversational or above, you can put it on your resume, either in a section on its own or under “Skills.” I have ASL (American Sign Language) and IPA (International Phonetic Alphabet) on mine. Teaching is a great skill to have, and it shows that you knew the subject material well enough to teach it to others. A teaching assistantship gives you the opportunity to know the department better, you can present to the class, and the organization required is nothing to sneeze at. List this under experience, quantify everything you do (spent 5 hours developing presentation on x, presented 20 minutes to 140 students), and make sure to show any new skills and accomplishments. If you’re planning to go into Archaeology, field school is a must. If you’re going into Anthropology, it’s still really useful. If you’re working outside of the field, it’s actually a super wonderful opportunity that you should take advantage of. You learn so many new skills, spend time using them, and spend a lot of time with people who are working in the field. Document everything you do, and emphasize it on your resume. Any service work you do shows community engagement, so be sure to put it on your CV, and put it on your resume as often as you can. If you would like to work in a certain community, make sure to get plenty of experience that applies there. For example, if you want to work with Latino immigrant populations, learning Spanish and volunteering at a Spanish speaking community program would be beneficial. You can have a Community Service section if you have a few different experiences, or you can list it under Activities or Experience. If you’ve written or co-written grants, even to get donations for your student group, you should definitely discuss that. Grant work is hard, and nonprofits and research institutions write them all the time. Any experience you have would be welcome. Remember, your resume isn’t just for listing jobs. You want it to be an accurate representation of what you have to offer. Your skills, experiences, and the causes you believe in should be on the paper as much as they can be. You’re a whole, well-rounded person, and your resume should reflect that. If you have any questions as to what should be on your resume, stop in for our Resume Drop-In hours Tuesdays and Wednesdays, 2-4 pm in SCC22. 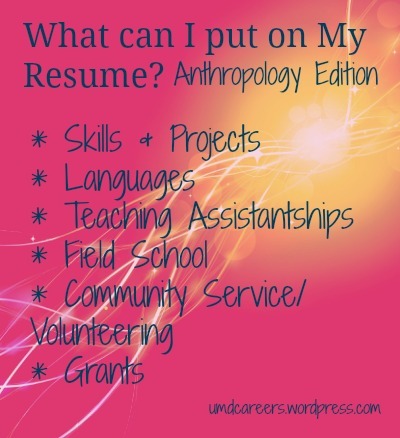 What can I do with Anthropology? I’m graduating soon, and with that comes a lot of thoughts about the future. I’m going into Social Work, so while I know grad school is going to happen, I’m not ready to apply yet. Even though you might not be filling out applications with your fellow grad school bound classmates, there are still some ways to prepare for it. Look at the programs that you’re thinking of applying to: check the website, talk to current and past students, and talk to professors if you can. You want to learn what they’re looking for in a student. This could affect your job choice in the interim. If your programs are looking for specific experience, you should know that now. A lot of grad schools require GRE scores, and some of them require subject tests. Your GRE scores are good for 5 years after you take them. If you’re planning on applying to grad school within that time period, it might be a good idea to do this testing while you’re still in school mode. It also gives you a definitive deadline for when you’re going to apply. Grad schools LOVE reference letters. Take a look into the grad schools you think you’ll apply for. Chances are they want 2 or 3. When you’re out in the workforce, you’ll want to make a good impression on your supervisors. Now, however, is a good time to get a reference letter from a professor or advisor who you think would help your application. Ask them if they feel like they could write you a (good) letter, and keep it on file. Keep in contact with this professors or advisors once you are done with undergrad. Let them know what you’re doing and where you are in the process when you finally get to applying to grad school. At that point you may want (or need) to get an updated letter or reference form – you want your UMD contacts to still be a good reference for you. Set some deadlines for yourself. Tell yourself that you want to apply in 3, 4, or however many years. Then prepare for that. Don’t commit to a job that isn’t going to go anywhere for 4 years when you’re planning on leaving in 2. This isn’t set in stone, and if, while you’re out in the world, you decide you don’t need (or want) to go back to school, then no harm done. One of the best ways to prepare for grad school while you’re not in college is to get out of school mode. Grad school is intense, no matter what the program is. So while you’re taking time off, get some experience out in the world. Whether that means working a “big person” job, or taking some time off and traveling, just do it. We all have goals, both short term and long term. Zach wrote a post about Long-term goals a few months ago. Now, making those goals is important. So is reaching them. When you’re thinking about what you want to do in your career, you also need to think about HOW you’re going to get there. Sometimes it’s hard to motivate yourself to work on something you won’t “need” for a year or more. The trick is to break it up into smaller goals and be accountable. Set dates you need to get something done (say, an application for grad school), and break it into smaller chunks. Tell someone when you need to have these done. Your parents, your co-workers, peers, a career counselor, or the people writing your references are all good choices, but essentially have it be whoever will keep you on track. When you get around to doing those big projects, sit down and get it done. We’ve all procrastinated, and it generally turns out just fine. But that doesn’t mean you can let yourself get away with it. If you say you’re going to finish a project, sit down and don’t let yourself get up until you finish it. Give yourself a reward every time you reach a mini goal (like that picture that was going around Facebook a while back: you get a gummy bear every time you read a certain amount), but don’t let yourself not finish. If you must procrastinate, do it productively. Say you sit down to write your essay, but you just can’t do it. Instead, update your resume, your cover letter, or write a paragraph on what you did at each job you had and what you want to do in the future. That way you get something done, and it may lead you to some inspiration. Or you can browse our blog. Set aside some time for just planning. Sit down for a few minutes each week and just go over what you have done and what you need to get done, then reevaluate your goals. Make sure what you’re currently doing is on track with what you want to be doing in the future. Every day you’re working on your career, so make sure it is what you want it to be. If you want, sit down with someone else and go over it, looking for patterns that are good and not so good. Talk it over with your advisor or a career counselor. HARMONY: People who are especially talented in the Harmony theme look for consensus. They don’t enjoy conflict; rather, they seek areas of agreement (CliftonStrengths for Students). People with Harmony are very good at keeping the peace. Whether it’s mediating disputes or getting two different groups to work together, people with Harmony are the ones who see both sides and attempt to get others to see them too. They are the perfect person to have in a collaboration effort, as they will strive to get groups to meet halfway. Harmonizers often see the things people have in common and will use that to connect people in the midst of a dispute. For example, those with Harmony will sit calmly at a meeting in which two developers are arguing over what design is better, and try to help them decide on a design that combines the best of both. When someone is venting at them, they will listen and nod, and then try to get them to look at it a different way, whether to solve the problem or just calm them down. Now that you know what Harmony is, what do you do to work with and develop it? As someone with Harmony, planning your career path to make sure things go smoothly may be helpful. The knowledge and experience of a Career Counselor may help you as you make decisions. Talk to people who work in jobs that you’re thinking about and ask them what they find rewarding about their job. Think about taking the Myers-Briggs Type Indicator to find what working environment works best with your personality. Jobs that involve working with people may be a good fit. With your ability to see sides, tolerance, and willingness to compromise, you’ll be a good person to have on the team (In order to complement your skills, you’ll want an Activator or Command on the team to, in order to keep the pace moving and settle disputes that can’t be mediated). Find an environment where the general consensus makes the decisions, and you can work behind the scenes to help make that consensus. Structure is important to: a job where things are regular and stable may be more to your liking than one that is always changing and causing upheaval. Let your opinion be known if you disagree. Sometimes, that can lead to a win-win situation more than being quiet. Remember: Having Harmony is NOT avoidance of conflict, don’t let others (or yourself) get away with dissing your Strength! Deciding to go to graduate school is not an easy decision. It isn’t even one decision, because there’s also the question of when to go. For people in different fields grad school means different things. Those who want to be doctors know that Medical school is in their future. Those who want to be elementary teachers may not even contemplate it right away after undergrad. There are many reasons to go to grad school. In some fields, you cannot get above entry level without a Master’s degree. 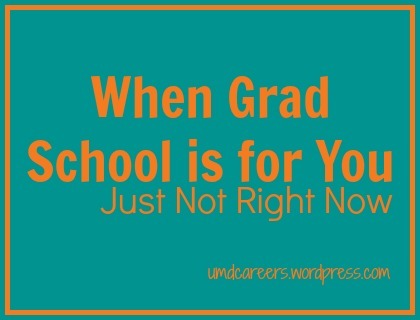 If that’s the case in your field, then grad school is probably in your future. For others, grad school is needed for specialization. Those with a major in the Social Sciences or Liberal Arts may need to go to grad school to achieve further qualifications. For instance, you went to school for Anthropology and know you want to study Archaeology in the Middle East. You may need some more schooling before you can do that. These majors certainly provide a firm foundation, but may not necessarily give you the specific job knowledge you need beyond entry-level positions. On the other hand, you may not need to go to grad school, and it would be more beneficial for you to go into the workforce. There are fields where advancement is made almost entirely based on experience, so further schooling right away could just put you further behind. For most computer-related jobs, you’re constantly being updated on new technology anyway, so learning on the job may be better. You can also over-qualify yourself for a job. Salary is based on experience and education level. If a job can be done by someone with a Bachelor’s degree and you’re going in there with a Master’s, they may not give you a fair shot because your salary can be expected to be higher from the beginning. In addition to the pros and cons of going to grad school, you have to think about getting in. Graduate schools want students who are going to go out into the world and represent them. They want people who are dedicated, and going to stay working in the field they’re trained in. They look at everything. This post, from Discover Magazine, Unsolicited Advice, 1: How to get into graduate school is all about what grad departments are looking for. It’s Physics/Astronomy specific, but the general information is pretty much universal. If you don’t think you’re qualified yet, you can spend a year working in a job related to your field, volunteering, studying for the GRE (or other exams); doing whatever you think you need to do. Burn out: you’ve been in school for what, 16 years straight? If you need a break now, take it. Money: Take some time off of school, pay off undergraduate loans, save up, get some job experience. Employer subsidies: In some fields, employers will help subsidize graduate school. But you have to have the job first. Job offer: If you got a job offer for the perfect out of school job, and it fits just what you need right now, there’s no need to blow it off for grad school. Grad school will still be there, this opportunity may not. Bottom line is there are many factors that go into simply deciding to go to graduate school. Take your time; talk it over with friends, family, your advisor, and a career counselor.